Wreningham is a small parish situated in the South Norfolk Local Government District. It has an area of some 621 hectares, and contains the medieval parishes of Little Wreningham and Nelonde. It is situated around 5km southeast of the centre of Wymondham, which it borders, and is largely agricultural in nature The name ‘Wreningham’ may derive from the Old English words of homestead of wrenna’s people. The earliest objects to be recovered from the parish are three Neolithic axeheads (NHER 9958, 9959 and 31281), as well as a Neolithic flint sickle blade (NHER 9957). No prehistoric monuments have been recorded, but the tip of a Bronze Age spear (NHER 28495) and a Late Bronze Age socketed axehead fragment (NHER 29341) have been discovered. In addition, an Iron Age Icenian gold coin (NHER 30210) has also be found, along with a possible Iron Age domed stud decorated with triquetra (NHER 29310), one other coin (NHER 30885) and an interesting object which may be a pendant from a brooch (NHER 31281). Extensive metal detecting in this parish has resulted in a large number of objects being recovered. Many of these originated in the Roman period, with objects from this period recovered from twenty-eight separate sites across the parish. Coins make up a large number of these, having been found at twenty-one of these sites, and include coins from the first (NHER 9961), second (NHER 30105) and third (NHER 9961) centuries. Particularly interesting is a hoard (NHER 31466) of 186 Roman silver denarii recovered with fragments of a pottery vessel. These coins were minted between 32/31 BC and AD 180. Brooches have also been a common find, recovered from fifteen sites in the parish and including Colchester (NHER 31416, 28494 and 30208) headstud (NHER 31286 and 30885) dolphin (NHER 28495) disc (NHER 28622) Aesica (NHER 28868) and Hod Hill (NHER 31281) types. Other objects of interest include a military buckle (NHER 28494), bracelet fragment (NHER 29310) and finger ring fragments (NHER 30885). A large number of Saxon objects have also been recovered. These include Early Saxon objects from eleven separate sites in the parish, from which a variety of interesting pieces have been found. Of particular note are a copper alloy bowl with a textile imprint (NHER 28495), a silver gilded escutcheon (NHER 30202) formed of two spirals with addorsed birds' heads in the centre and a repousse buckle plate (NHER 31281). Brooches have also been a common find (NHER 30201, 30885 and 35712), including cruciform, supporting arm (NHER 32035), and small-long (NHER 28622) types. Middle Saxon objects have also been recovered from seven sites, and include objects such as a possible copper alloy biconical pin head and stylised animal-head strap end terminal (NHER 28495) and a strap end which features an animal head terminal and silver wire inlay (NHER 30201). A Middle Saxon strap end with possible enamel or niello (NHER 31284) is also of interest, as well as a 9th century square mount with well-preserved gilding and silvering, which is thought to have been made in northern France (NHER 35362). Other Late Saxon finds include a finger ring and animal head fitting (NHER 28494), another finger ring and a number of disc brooches, including one Middle to Late Saxon nummular disc brooch depicting a profile head with beard (NHER 28622). At least two pieces in the Ringerike style have also been discovered, one of which was a mount (NHER 28868) and the other of which was a harness cheekpiece (NHER 29307). Also of interest is a lovely Late Saxon box mount depicting an animal with a raised head and front paw (NHER 30209). It should also be note that Wreningham is listed in the Domesday Book of 1086, and it is not perhaps surprising that the parish also had a church. 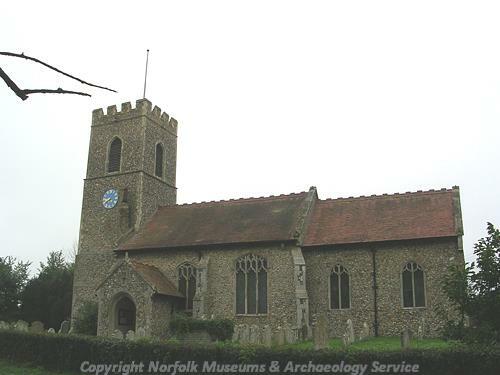 Today the modern parish contains three medieval parishes, those of Little Wreningham, Great Wreningham and Nelonde. All three are thought to have had a church, though today only All Saints’ Church (NHER 9996) survives. This was the church originally associated with Great Wreningham, although it became the parish church for all three settlements in 1414 when the parishes were united. Today All Saints’ is almost entirely Perpendicular in style and date, though the collapse of the upper stages of the west tower precipitated rebuilding and restoration across the building in 1853. The earliest surviving work in the church is the lower stage of the tower, which dates to the 13th century. However a niche in the west face contains a stone monster which may predate this. Whether this is the church mentioned in the Domesday Book, or even the site of that Late Saxon church, is unknown. The settlements of Little Wreningham (NHER 9942) and Nelonde (NHER 14458) no longer survive, and although we know their approximate location no surface archaeological features survive to show us their exact positions. A number of other medieval sites are known, and this includes two possible (NHER 9991) or destroyed (NHER 9952) moated enclosures that might have been associated with high-status dwellings or settlement. Only one secular medieval building survives, and this is High Common Cottage (NHER 18441), which is thought to have been built at the very end of the medieval period, as a open hall house. Three original queenpost trusses in the roof survive, and the screens passage has western service doors. A large number of medieval objects have also been recovered from across the parish. This comprises objects such as coins (NHER 28622, 29309 and 30208), pottery sherds (NHER 35044 and 28494) and buckles (NHER 30212, 30391 and 31282), as well as personal items such as seal matrices (NHER 21168, 30201 and 35712), strap fittings (NHER 28495, 29310 and 30209) and keys (NHER 28868, 30207 and 30885). Objects of particular note include a lovely 13th century gilded buckle plate with a low relief mythological bird (NHER 28494), a silver bell (NHER 29386), a gilded casket mount (NHER 30206), a gilded buckle plate (NHER 30263), and a lead pilgrim’s ampulla from Walsingham (NHER 31284). Similar post medieval objects have also been found, with those of interest including a 19th century spoon bowl (NHER 30391), and a 17th century hemispherical button (NHER 31286). There are also a number of buildings of interest from the post medieval period, such as The Poplars (NHER 12314), a timber-framed house dated to 1586 with crowstepped brick gable ends and octagonal chimneys. Of a similar date is High House (NHER 19482), which is a brick L-shaped building with ovolo mullioned windows with transoms and stuccoed reveals. A little later in date is the 17th century Fir Grove (NHER 13920), which is also timber-framed and has thatched and plaintiled roofs (NHER 13920), as well as a 19th century porch with crow-stepped gable. Also of note is the late 17th century timber-framed and thatched Glastonbury Cottage (NHER 34433), the single storey 17th century timber-framed and thatched Old Homestead (NHER 34434), and Willy’s Croft (NHER 36180), which also dates to the 17th century and is partially timber-framed with a thatched roof. Other sites of interest include an Admiralty semaphore telegraph station (NHER 14979), which was present ‘on high ground near church’ and was part of the London to Great Yarmouth line. The site of a post medieval post mill is also recorded (NHER 15391), and the Wymondham to Forncett Railway Line (NHER 13580) is also recorded. This was opened in 1881 to allow trains to reach the north coast without entering Norwich, but had a short operating lifespan. It closed in 1939 to passengers and in 1951 to goods trains, with only a stub of track surviving as sidings. World War Two also left its mark on the parish, but today the only surviving remnant is a pillbox or air raid shelter (NHER 20985). It is a rectangular brick building with a shielded entrance and concrete slab roof, and was probably originally connected with Hethel airfield to the north.